Pink Viatek Flex Bike Ultra is compact, foldable, functional and sturdy with several user-friendly features. It offers a few levels of magnetic resistance to challenge you more and help you burn more calories. It comes with the integrated resistance bands so you can work on your upper body, not just your lower body like with other bikes. You have the pulse sensors on the fixed handles, that are linked to the LCD display panel which tells you your heart rate, distance, calories burned, time, speed, ODOmeter and scan. You’ll also see the Reset, Mode and Set buttons just below the LCD screen. With its convenient folding design and integrated transport wheels, you can roll it away easily and effortlessly. It has a sturdy build with a heavy-duty steel frame and good quality components. The seat with a backrest has a thickly padded cushion that makes it comfortable especially over the long exercise sessions. 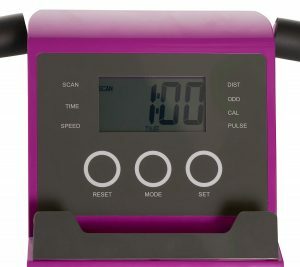 It is also adjustable for height and distance from the handles and LCD display. It has the anti-slip foot pedals with security straps and you can feel safe on its sturdy frame. There won’t be any shaking or wobbling as long as you put it on a flat surface. Flex Bike is shipped unassembled and you need to put the parts together. It is easy to do and will be easier if you have a second person helping you out. It weighs 39 pounds and measures 41 x 21.5 x 42.5 inches and 54 x 21.5 x 17 inches as folded. In the box, you will get the Flex Ultra Bike, tools and instructions for assembly and two AA batteries. The bike is also easy to clean with a damp cloth. The Flex Bike Ultra by Viatek is a good quality bike for home use that rides very smoothly and quietly. One of the customers commented on the difficulty of folding up the bike, that it was not very easy for them. And another customer complained about the height of the bike, that they weren’t feeling comfortable as a short person. But for the sturdy build quality, good looks and features it is an affordable bike at a reasonable price. Flex Bike is offered with a year of limited warranty by the manufacturer. It is an imported product but is stocked in the US and shipped quickly in a few days via Amazon.com.